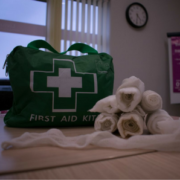 Workplace first aid training is designed to provide you with the skills to manage and treat illness and injury effectively in a working environment. It is a measure used to protect you, your staff and anyone entering your premises. 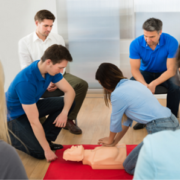 Choose from all the major first aid training courses below. We run our open first aid courses from our training centre near Boroughbridge, North Yorkshire. Every business is different and will require different needs. So, there are a few things to consider before you decide of which first aid course is right for you. Is your business high risk or low risk? High risk environments are those with higher level hazards. For example, those working with chemicals or heavy plant machinery. 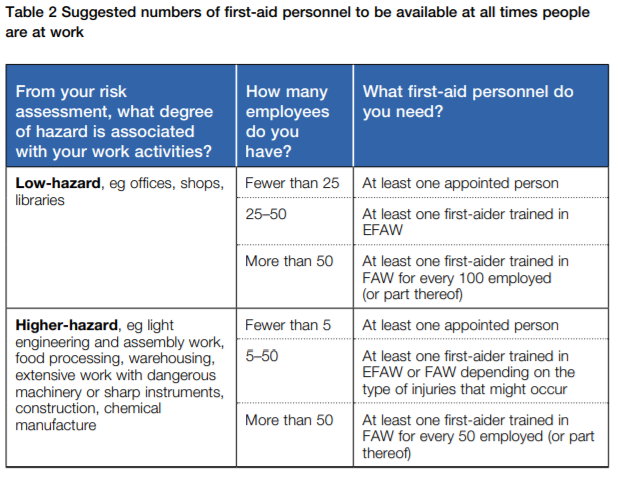 High risk business will need more first aiders and additional training to cover the potential illness and injuries. 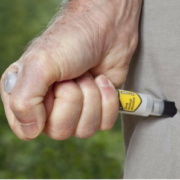 The greater the number of people, the greater the number of first aiders are required. 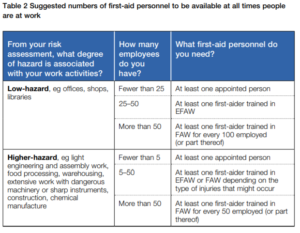 Check out this HSE Guidance for the number of people vs number of first aiders. Are there young, inexperienced employees or those with specific disabilities or health problems? 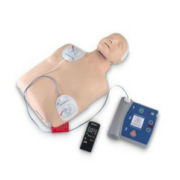 First aiders may need greater levels of training to handle these requirements. Specific training to handle illness and injury as a result of disabilities and health conditions may be required. Do your accident reports suggest a pattern? Specialised first aid may be needed to treat frequent injuries. Also, consider whether training (such as health and safety training) can help reduce the numbers of these injuries. Do employees work in shifts? Ensure there is always a first aider present on each shift pattern. You’ll also need cover for annual leave and any absences. The governing body is responsible for producing the health and safety policy for a school. Then, it is up to the head teacher is to put the governing body’s policy in place and develop detailed health and safety plans. Schools are obliged to provide adequate first aid equipment, facilities and qualified first aiders. They do not have to provide first aid to anyone but their own staff. 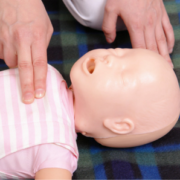 However, they are advised to consider the pupils when deciding on their first aid provisions. How many buildings does the school have? When a school has multiple separate buildings, it is advised to have a first aider in each. Are there any pupils or staff with specific health needs? First aiders may need greater levels of training to handle these requirements. Specific training to handle illness and injury because of disabilities and health conditions may be required. Is there adequate provision for lunchtime, breaks and after-school clubs? Staff overseeing lunchtime, breaks and after school clubs may want to receive first aid training to deal with any accidents occurring under their supervision. Are you covered on school trips? First aiders will be needed for school trips and offsite activities. But, remember to have adequate numbers of first aiders remaining at the school in their absence. 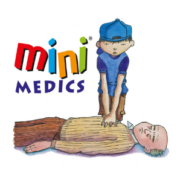 Note: Emergency First Aid at Work and First Aid at Work do not provide information for the resuscitation on children. 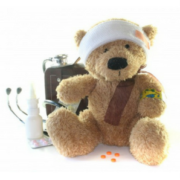 Paediatric First Aid and Emergency Paediatric First Aid may be more suitable for cover of pupils in primary schools.